Due to overwhelming demand (OK, one person), I’ve decided to post something. I’ve been using a version of Linux as my main desktop OS for maybe five or ten years now. Although Linux, speaking generically about the various distributions, has made progress on many fronts, it can still be a pain when it comes to peripherals (e.g., audio, video, cameras, iphones, scanners, etc.). Today, I am (again, long story) creating a tutorial on getting the internal speaker working on my Dell OptiPlex 760. I need to create this so I can remind myself what I’ve already learned a couple of times now. I’m using Ubuntu 10.04 LTS, also known as Lucid Lynx. These instructions probably won’t work if you are using another version of Ubuntu (Editorial comment: because of how they, seemingly, randomly change applications and configurations). In any case, the Dell PC has an internal speaker that no version of Ubuntu I’ve tried defaults to using. I can plug in external speakers or a headphones and hear the sound fine. But the internal speaker is not enabled, and as far as I can see, unless you add some software or find the right configuration file/command line instructions, you can’t enable it. So, this tutorial is to remind myself how to do so. Before I go farther, please insert the standard disclaimer here. This entire site is provided “as is”, without any warranty whatsoever. Following these instructions may cause high fever, dandruff, and/or the complete loss of all data on your device – not to mention Thermal Nuclear War. 2. Type in your password then use the “Quick search” box to find gnome-alsamixer. 3. Mark it for installation and Apply the change. 5. 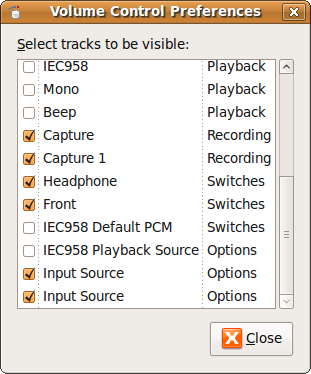 Check if “Beep”, “IEC958”, or “Mono” are “Muted” (i.e., the little box at the bottom of the columns for each of the categories is checked). If any are muted, unmute each one and test your sound. How you test your sound is a task left to you, dear reader. If all else fails, unmute all sources on the mixer. If that fails, check the Master level to ensure it’s not set to zero (i.e., at the bottom of its slider). Done. At least, it works for me. Twitter friend @johngarcia is a second round @Audi http://www.voteforprogress.org/ contender. Audi will donate $25,000 to charity as part of the winning prize. Holiday greeting which is acceptable for dissemination to anyone, is politically correct and entirely non-offensive; yet contains no substance and is really annoying. Please accept my non-denominational holiday wishes with no obligation, implied or implicit, my best wishes for an environmentally conscious, socially responsible, low-stress, non-addictive, gender-neutral celebration of the winter solstice holiday, practiced within the most enjoyable traditions of the religious persuasion of your choice, or secular practices of your choice, with respect for the religious/secular persuasion and/or traditions of others, or their choice not to practice religious or secular traditions at all. I also wish you a fiscally successful, personally fulfilling and medically uncomplicated recognition of the onset of the generally accepted calendar year 2011, but not without due respect for the calendars of choice of other cultures whose contributions to society have helped make America great. Not to imply that America is necessarily greater than any other country nor the only America in the Western Hemisphere. Also, this wish is made without regard to the race, creed, color, age, physical ability, religious faith or sexual preference of the wish. Insert disclaimer here. Even if you follow these instructions exactly, it may not work for you. In fact, it may make things worse. If you proceed, you do so at your own risk. I don’t have the time to try to make it work for you so you are on your own. YMMV. We just got some Dell Optiplex 760 PCs. They came with XP Pro but I also wanted to install Ubuntu 9.04. After installing Ubuntu most things worked, with the notable exception of the PC’s internal speaker. If I plugged in a headphone, I could hear sounds being correctly played. But nothing was coming out of the PC’s internal speaker. Step 1. is to open the Gnome volume control by starting the Gnome “Run Application” dialogue box via Alt+F2 (that is, hold the Alt key while also pressing and holding the F2 function key). And then click the “Run” button on the dialouge box (see image below). Step 3.If you see a slider marked “Beep” (if you don’t, skip down below) make sure there isn’t a red line through a circle below the slider or that the slider isn’t at the bottom most position. If you see the red line and circle, click on it and that should un-mute that device. You may still need to move the sliders if they are at or near the bottom (I used my mouse to move the sliders to the top most position). Done. Beep control showing muted, and at minimum. Step 4.If you don’t see a slider marked “Beep”, you need to click on the “Preference” button and then scroll through the devices until to see “Beep” and check mark that device. Step 5. You should now see a new slider marked “Beep” and you can see if it is muted (slash through red circle) and or the sliders are at the lowest setting. If either or both is true, do as above and click on the circle to un-mute the device and move the sliders to the topmost position. Beep un-muted and sliders at maximum. Well, that was interesting. I have an iPhone. In order to use some of its features, I have to go through iTunes. One of these features is the iPod part of the iPhone. I like to listen to music that I enjoy and I like all kinds of music. Since most radio stations play only a very narrow range of music, having my personal selection with me in my iPhone works well for me. Recently, Apple announced a program to upgrade its DRM low-fi tracks to no-DRM higher fidelity versions for the low, low price of 30 cents per track. Not only would I be getting better sounding music but they would no longer be locked into an Apple silo. So, this past weekend I agreed to pay Apple about $50 to upgrade the tracks that were available. Unfortunately, for some reason two problems occurred. First, although I paid for a certain number of songs, when it came time to download, not all songs came through. That is, I paid for songs that were not upgraded. Secondly, once I synced iTunes with my iPhone, ALL the music on the iPhone was converted to “Other” and became unplayable. Let me repeat that last part. All the music, whether purchased from Apple or ripped from my own CDs, were no longer considered to be music by my iPhone and was therefore unplayable. Even though I tried to re-sync, iTunes refused to do so because it said there was insufficient room on my iPhone. Although this was true, it was true only because iTunes had converted all my music into whatever “Other” is. Now, what I’m going to describe to solve this problem worked for me. However, that does not mean and I do not recommend you follow. In fact, if you run into the same problem, I recommend you contact Apple support. YMMV. Insert disclaimer here. What I did was to use iTunes to restore my iPhone. Part of the process is that iTunes resets your iPhone back to its factory defaults. Hence, when it asked if I wanted to pack-up my iPhone I clicked yes. Once it began, it took some time while iTunes did whatever it did but when done, all the former songs identified as “Other” were gone. Hence, I was now able to re-sync my music, all of which successfully transferred from iTunes to the iPhone! In addition, all contacts and calendar events came in OK.
Now, as to the first problem, I’ll have to follow-up with Apple on that. In Googling on this problem, I found that I wasn’t the only one so you need to be careful that if Apple charges you for 50 songs, that you actually find 50 songs downloaded when you are done. This past weekend, I deleted the last Windows desktop partition at home. Now I have desktops running only Linux (Ubuntu desktop, Ubuntu server, and Mint, respectively), but no Windows. On the other hand, both laptops still have Windows (one has XP and the other has Vista). I have to keep Windows on the laptops because of problems with Linux drivers (either non-existent, alpha-level, or just don’t work). Some day, I hope to be Windows free, but that may not be for awhile. In deleting the partitions on the last Windows desktop, I had an interesting experience. Prior to removing Windows, I was dual booting Xandros and Windows. But in addition to Xandros, I had at one time tried installing an earlier version of Ubuntu. Unfortunately, the install failed and no matter what I tried, within reason since I did not want to loose my Windows partition, I could not delete Ubuntu. But at this point, since I would be reformatting the drive anyway, I decided to experiment and see what I could do. To make a long story short, after using PartionMagic I ended-up with a non-bootable disk. Sigh. Fortunately, I had Mint on a disk and was able to boot using the disk and then access the Windows partition and copy off my data. I then nuked the disk and started with a fresh install. Oh well, that was interesting. Not.